we can rescue those treasured memories! We can rescue those treasured memories! Just bring us the shoeboxes full of photos or slide trays full of slides and we'll scan the photos for you! Scanning can take a lot of time and effort to do it yourself, or it is really expensive if you have it done custom. Until now... Our "Shoebox Special" is just the thing you need to get a lot of prints, slides or negatives scanned for not a lot of money. We will attempt to clean and use "Digital Ice" to clean the items being scanned, but we will not make heroic efforts or make any attempts at cleaning that may harm the original. ‍Bring us your shoebox of old prints from wallet size to 8x10, and we'll scan and save them to DVD or CD. All scans are made the original print size at 300DPI. Higher, 600DPI scans are also available upon request. Specify whether files are to be saved on CD or DVD's; same price. Saving to Yes DVD for TV viewing is also available for slight fee. Yes DVD cannot hold more than 500 files. CD's can hold about 500 files, DVD's can hold about 4000 files depending upon the size of the original prints and resolution. Original size must be at least 2"x3" and not larger than 8"x10" from photo originals only (no slides, negatives or Polaroid prints) Copyright laws WILL be enforced, so any professional photos will need a copyright release. Originals must be in good condition, not bent, warped, torn or sticking to each other. Photos cannot be mounted, laminated or taped. Photos are scanned as is. Any fingerprints, scratches, tears, cracks, watermarks, ink or discoloration will not be repaired, see digital restorations listed below. 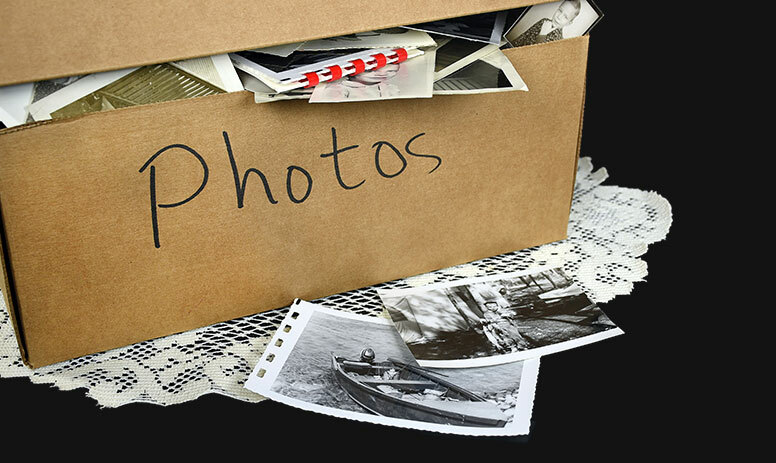 Photos that are Polaroid prints, too fragile, laminated, mounted or too thick to be scanned as a shoebox or are smaller than 2x3 will not be scanned with this service, but can be hand scanned. Turn around time is one to 2 weeks depending upon workload and the size of the order. ‍Bring us your 35mm or APS negatives in cases, wallets or rolls in either black and white or color. We can scan them to DVD or CD so you can see and use your old negatives again. Email them to friends, make photos books and gifts, see you old photos on your computer anytime you want them. 35mm negatives will be scanned to 4x6, 300DPI; APS will be scanned to 4x7, 300DPI. 600DPI equivalent is 50% extra. Specify whether files are to be saved on CD or DVD's; same price. Saving to Yes DVD is extra and can hold no more than 500 files. Strips are cut negatives with at least 2 frames on a strip. Strips or negatives with only one frame are a custom scan. Approximately 500 to 700 files will fill up a CD, 2500 files will fill up a DVD; depending upon format and roll length. 35mm and APS negatives are available as shoebox scans. Other formats do not apply and must be custom scanned. Originals must be in good condition, not bent, warped, torn or sticking to each other, or rolled so tight that they cannot be flattened easily. Negatives are scanned as is. Any fingerprints, scratches, tears, cracks, watermarks, ink or discoloration will not be repaired, see digital restorations listed below. Non-conforming negatives will be scanned as custom scans. Turn around time is one to 2 weeks depending upon workload. Specify whether files are to be saved on CD or DVD's; it is the same price either way. Saving to Yes DVD is extra and can hold no more than 500 files. Original size must be mounted 2x2 inch slides or 35mm slides formats. Slides cannot be glass or metal mounts. Copyright laws WILL be enforced, so any professional slides will need a copyright release. Approximately 500 to 700 files will fill up a CD, 2500 files will fill up a DVD; depending upon format. These are from good quality original slides. Good quality refers to slides that are not torn, have excessive curl, creases, scratches, warped, dog-eared mounts, damaged mounts, folds or other large defects or improper exposure. Otherwise these will be rejected and scanned as custom. Slides are scanned as is. Any fingerprints, scratches, tears, cracks, watermarks, ink or discoloration will not be repaired. Slides that are too fragile, mounted in too thick a mount to be scanned as a shoebox or are not 2x2 inch mounts will be custom scanned. Turn around time is 5 working days per 200 slides.